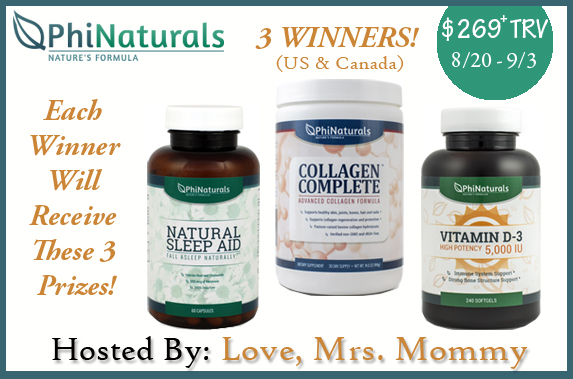 Love, Mrs. Mommy: Phi Naturals Vitamin Giveaway! 3 Winners / 3 Prize Packs! A $269+ TRV! Phi Naturals is a health & beauty company founded by two doctors, Dr. Rick Argall and Dr. France Carpentier, who have a combined experience of over 70 years in healthcare. Since founding the company, the doctors have had a focus on product quality and providing an excellent customer experience. All of Phi Natural's products are formulated by the doctors with the assistance of chemists, herbalists and nutritionists. All products are proudly made in the USA at an FDA-registered lab. A prize package worth $89.89! x 3 winners = $269.67 TRV!